Parasuicide is the parody of suicide in which the person acts like doing suicide but in fact he is not doing it. The Parasuicide is considered the prediction of suicide attempt. The patient looks like attempting suicide but he is not doing it to harm himself. These acts are called suicidal gestures. Mostly women of age range 15 to 25 are involved in this act. Mostly women who are under depression like divorced women, married teen women and single women attempts these suicidal gestures. According to research, suicide is the 3rd leading cause of death in people ranging 10 to 24 years. According to research, the types of Parasuicide are checked with a method named cluster analysis. The following types are reported till yet. Operant (not alienated) it is the enforcement or modification of human behavior which inhibit the person ability to think over it. And these acts are not done solemnly. Depressed persons facing high level endangerment in life. Operant and alienated acts (not in response to any thing, these acts are sudden and spontaneous) done differently and solemnly. Wrist cutters (the person cut his wrist not intentionally. Other undifferentiated types are also reported. The some of parasuicidal methods are proved lethal sometimes. There are 90 % of deaths are reported due to the use of firearms. Wrist cutting rarely proved fatal for the person. It is also reported that self-poisoning is also responsible for death in 70 % of patients. So person also attempt to suicide by taking sleeping pills in toxic dose. 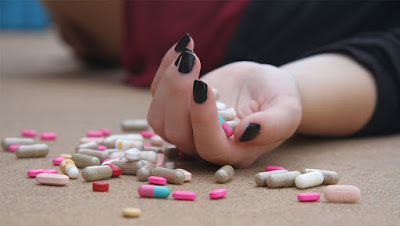 Drug overdose is also a method of Parasuicide most commonly occurred in women. Frequent and repetitive use of analgesics in women. Jumping from the height for the purpose of fun and to eliminate phobias if any. There may be many causes behind parasuicidal attempt. Depression and anxiety are the two main causes reported behind these parasuicidal attempts. It is commonly seen in women and teenagers who are fed up of their life. Emotional disturbances and pain, feelings of unpleasant life and thoughts of harming own self not for the purpose of getting killed are also the reasons behind parasuicidal attempts. To get peace in life, mostly women started taking pills which lead to the parasuicidal attempt one day. Marital status, un-employment, sudden unwanted change in life and mental disorders are also reported causes behind parasuicidal attempts. The person who attempts Parasuicide may suffer from a mental disorder named borderline personality disorder. The deregulation of emotions is also reported behind parasuicidal attempt. Psychologists make a questionnaire according to the condition of patient in order to understand the psychology of patient. The psychological disorders also make the patient to attempt Parasuicide. A negative mood due to the cardiac pre-ejection period may also lead to the Parasuicide attempt. The uncontrollable anger is also a psychological disorder. The depressed person in search of happiness or by fed up from life urge to attempt Parasuicide.